"When you play in a band you come closer to the other people in the band. If you happen to not know someone at first, they could become your best friend by the end of the year." "Her lesson and band practice are the highlights of my daughter’s week. And the amazing thing is that the kids get together every weekend and have their own rehearsal." 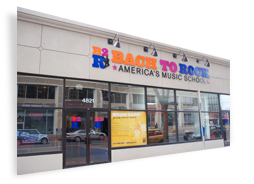 Our staff will contact you to review and finalize schedule for instruction at B2R. Please note that enrollment is not complete until we have contacted you and confirmed availability of your selection. Thank you.